Worldcat Discovery provides a fast and easy search portal for jump-starting your research process. Whether you need to find a specific book, or a selection of articles for your paper, or explore general scholarship on a topic, Worldcat is a great place to begin. 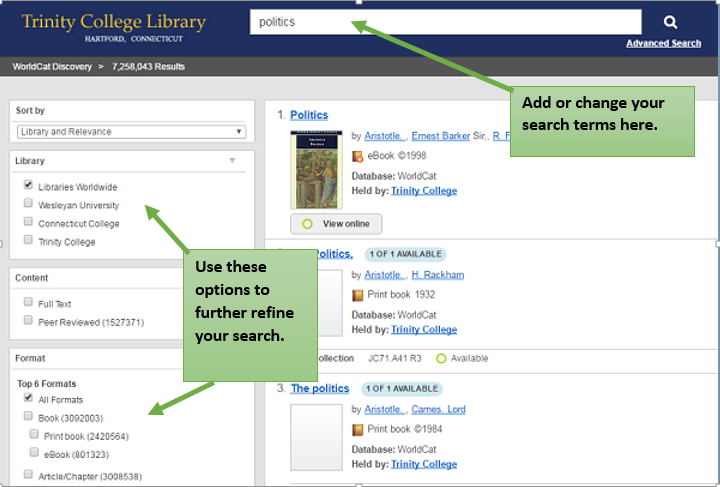 Perform one search to find a variety of materials and formats, instead of searching the catalog and article databases separately. Use it to request books and other materials from CTW or other colleges and universities. In many cases, you can reach the full text of an article directly from Worldcat Discovery. Easy options to copy or send a formatted citation.